From the Caribbean to the northern Atlantic coast of the United States, many people are still experiencing hardship and difficulties due to Hurricane Sandy. Thanks to the generosity of people like you, we continue to walk with our brothers and sisters who are recovering from this disaster one year later. Your help is still needed. 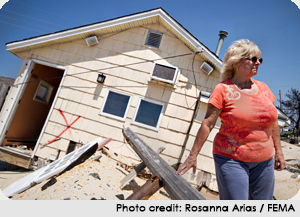 We are still responding in areas affected by Hurricane Sandy. In Maryland, New Jersey and New York, we are working hand-in-hand with synods and social ministry organizations who are experts at outreach in their communities. Your donation now will help address the needs of families and individuals; build and reconstruct homes, communities and congregations; coordinate volunteer efforts from people across the country and support case managers working directly with those who have lost so much. Gifts to Lutheran Disaster Response, designated for "Hurricane Sandy" will be used entirely (100 percent) in response to this disaster. Join our disaster work and help provide the long-lasting support that is already underway in the affected regions.